Here is Young Poppy - a very welcome addition to the Lockie Household! Her name, registered with the Kennel Club, is “Housty Alice”; her parents are F.T.W (Field Trial Winner) “Helots Predator”, and “My Lucky Lady”. We have called her Poppy, the name we would have given the second dog if ever we'd got a companion for “Wishful Thinking”. On occasion this gets shortened to “POPS” - could this be worse than going out at night calling “Wishy” I wonder? But mostly I call her “Poppet” 'cos she is one! As the F.T.W. might suggest, she comes from gun-dog stock, unlike Wishful Thinking, who was bred for Show. We shall of course give the matter of her going out to earn her living serious consideration, but I suspect she will simply loaf around on the floor, on the chairs, &c. &c. whilst Mummy waits on her hand and paw! Doesn't she look adorable? Sadly, today, Poppy is no longer with us. She passed away peacefully on Friday 13th January 2012, and is greatly missed. She's been with us since 22nd September 1999. 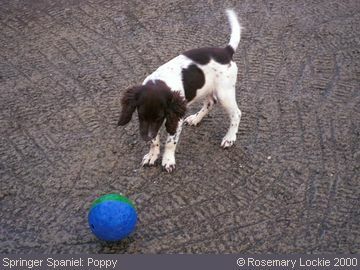 She was born on 27th June 1999, at Housty Kennels, Felindre, Swansea, Wales, and these images are of her around 16 weeks old. 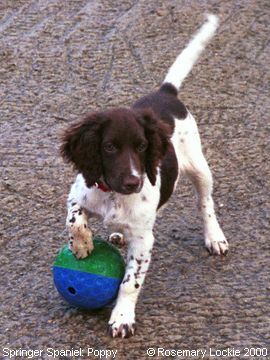 Note the muddy front paw, particularly noticeable on the image above, where she has her paw on the ball. A brilliant, and possibly lucky camera shot on my part, even though I say so myself. She was moving around so quickly it wasn't easy to capture her, and I'd really no idea I was going to get this ‘gem’ until the film was developed! !